BY A. D. P. VAN BUREN. From Abraham on the plains of Mamre, to the shepherds tending the flocks among the Judean hills, long before “they hung their harps on the willows and sat down by the rivers of Babylon and wept,” all through those periods of history, we find a tendency to pastoral communism. Coming down to the middle ages we find the monks occasionally trying communistic life. And reaching our own time, we shall have Louis Blanc, Saint Simon, and Charles Fourier in France, Robert Owen in Scotland, and his son, Robert Dale, in America, giving to the world the theory and practice of what is commonly known as socialism in Germany, communism in France, and Fourierism in America. From these, which essentially are one, .communists, Alphadelphians, and the late cociperationists, with various other theories and theorists. ORIGIN OF ALPHADELPHIA ASSOCIATION IN COMSTOCK. “The Kalamazoo river is a large and beautiful stream, nine rods wide and five feet deep in the middle, flowing at the rate of about four miles per hour; and with eight feet fall, which can be obtained, without flowing any land worth mentioning, by digging a race one mile and a half in length, it will propel 100 run of stone in the dryest season. The digging is easy and may be nearly all done with scrapers and teams.” They then speak of “the place where the mansion and the manufactories will stand;” on a beautiful plain descending gradually toward the river, a plain 50 to 60 rods wide, skirted on the south by a range of hillocks about twenty feet high and running parallel with the river. Beyond these, some 10 or .’l0 rods, is a gentle, undulating plain, extending south, east, and west for miles, and being covered with the most thrifty timber your committee ever beheld, consisting of whitewood, black, white and blue ash, white and red oak, two kinds of beech, and two cf elm, black walnut, soft maple, some cherry and especially hard maple in large quantity and the best quality. “There is a spring, pouring out a barrel of water per minute, one-half a mile from where the mansion and manufactories will stand.” They say cobble stones for buildings and dams are plenty on the domain; and sand and clay for making brick, in abundance. “Iron ore is known to exist on the domain, but its extent is not yet found out. The Michigan Central railroad will run l| miles north of the proposed site of the mansion. They found no cause for fever here; there were only two out of 150, in seven years, who died of fever. “The soil of the domain is exceedingly fertile and of great variety, consisting of prairie, oak opening, timbered and bottom land along the river, and about 3,000 acres of it have been tendered to our association as stock to be appraised at the cash value. Nine hundred acres of this land has been cultivated and nearly all the rest has been offered in exchange for other improved lands owned by members living at a distance. The convention there perfected, engrossed, and adopted their constitution, which was signed by 51 members, nearly all fathers of families and respectable and thrifty farmers, mechanics, and manufacturers. This number might easily have been doubled in Bellevue and vicinity, but the convention thought proper to restrict the membership, for the present, to those who had taken an’ active part in the enterprise. The following is a list of the officers elected at this Bellevue convention: President, Dr. H. R. Schetterly of Ann Arbor; vice-president, A. Darrow of Bellevue; secretary, E. S. Camp, of Marshall; treasurer, John Curtis, of Norville, Jackson county; directors, G. S. Avery and Alanson Meech, Bellevue; Harvey Keith, Wm. Earl, and Dr. Ezra Stetson, Galesburg; Wm. Grant, Sandstone; Amos Picket, Anson Delamatter, and C. W. Vining, Columbia, Jackson county; Charles Mason and H. B. Teed, Battle Creek. 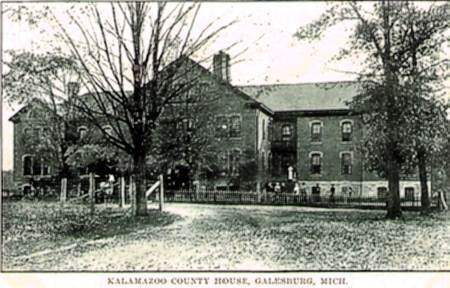 “Galesburgh, Kalamazoo Co., Dec. 27, 1843. Under such favorable auspices the work of founding an association in Comstock was soon effected. It was first intended to build the mansion on the south side of the river; but the other side was afterwards selected for this purpose. The domain was intended to include the southeast quarter of the township of Comstock. The first year of the organization the association had possession of nearly all of section 23, the west half of 24, and a large part of the north halves of sections 25 and 26. The first meeting on the domain was held in the house of Harvey Keith, at 8 o’clock A. M., March 21, 1844. The directors were Spencer Mitchell, Anson Delamatter, John Curtis, H. G. Pierce, John White, Henry H. Reading, James Weeks, Wm. S. Mead, Albert Whitccmb, H. R. Schetterly, David Ford, and Benjamin Wright. The name of the association was to be “Alphadelphia, or First Brotherhood;” its officers, a president, vice-president, secretary, treasurer, and twelve directors. At this f.rst meeting the above directors chose for president, Anson Delamatter; secretary, Henry H. Reading; and the association went to work. I cannot find the treasurer’s name, nor the vice-president’s. The meetings were held in the house of the resident members until the mansion was built. The Comstock members lived in their own houses, and those who came from abroad were accommodated with such homes as they could get, until a long shanty was built on the north side of the river, which was occupied as a general “tabernacle” by the new members until the mansion was erected in the fall of 1844. This building was originally some 20 by 200 feet, and two stories high. The constitution was explicit and ample on the subject of education, general health, and moral reforms. Any person of good moral character, of 21 years of age, could be admitted to membership by a two-thirds vote of the members present, provided he had six months’ provision for the future, or the means to furnish it. They were to reward operatives in proportion to the labor or skill bestowed, and they were to equalize the labor and skill of males and females. The latter could become members at the age of 18, by the requisite vote of the members. The organization having been thoroughly effected, the mansion built, the property, both personal and real, of every member, having been appraised by competent judges appointed for that purpose, and the amounts entered upon the books of the association as credit to each member for so much stock, at fifty dollars a share, Alphadelphianism was then ready to drive its teama-field and turn its first furrow. Then tl»e busy hive of Alphadelphians could go forth to work, each in his or her special vocation; some as farmers, some as housewives, others as doctors, teachers, editors, and printers; some as mechanics, teamsters, tailors, brickmakers, men of all work, till all the professions, trades, callings, talents, skill, and labor of the association that could be made available, was turned into its proper Held of usefulness. This was the great object for which the organization was effected, to live and work together in harmony and enjoy the benefits of each other’s society and the fniits of their own labor, like a united, happy family. How far they succeeded in accomplishing this, their four years’ trial, that ended in a total failure, plainly tells. From the old census list taken by C. L. Keith, in May, 1845, I find the number of male and female residents on the domain to be 188. There must have been at this time, counting resident and non-resident members, over 300 in all. The total value of the association’s real estate, as appraised March 9, 1846, by Lyman Tubbs and E. M. Clapp, of the general council, was $43,- • 897.21. The first death on the domain was that of the son of S. W. Vinton in 1844. The first marriage was in October, 1845, when Rev. Asa Bushnell made one for life, our old pioneer friend P. H. Whitford and Miss Emeline A. T. Wheelock. The Alphadelphia poet, C. H. Bradford, sonnetized the happy pair in the columns of the Primitive Expounder, where you will find a poem on the occasion of their marriage called the “Socialist’s Bride.” We have heard Mr. Whitford remark that he “went into the association with a yoke of oxen and came out with a wife and a buggy.” We don’t know how valuable the buggy was, but every one of his old friends will say that he left the Alphadelphia domain with a great prize—his estimable wife. A large number put their farms into the association; others put in various kinds of property; James Noyes put in his saw-mill, which was valuable in furnishing lumber to the society. That some of them lost much of what they put in; and that others sacrificed a great deal to get their farms back, or in taking “what they could get,” as an equivalent for the property they had brought there; and that some lost all they put in; and that some went away richer than they came: I believe one and all of these to be true. 1844. July 23. Sold to H. G. Pierce. 1848. April 30. David Ford, Dr. The last family on the domain was Hannibal A. Taylor’s; when the county purchased the property in the spring of 1848, Mr. Taylor delivered it over to. the purchasers as a “county house and farm.” Dr. H. R. Schetterly, the guiding genius of the association, left with his family (just before Mr. Taylor did) and went to an institution of like character, called the “La Grange Phalanx,” in Indiana. From La Grange he went to another society of the game nature in Wisconsin, called the. “Wisconsin Phalanx.” From Wisconsin. he came to Michigan to take charge of the government light-house at Grand Traverse. Here he was some few years ago, and this is the last trace we have of Dr. H. R. Schetterly, the founder of the Alphadelphia association, in 1844, in Comstock, Kalamazoo county, Michigan. Most of the information contained in this history, I have received from C. L. Keith and Hannibal A. Taylor (old Alphadelphians) and from the books and papers of the association which they have in their possession. That this system lacked the elements of success is as clear now to the minds of the old members as that effect follows cause. In trying to get information from some of the old pupils in this Alphadelphia school, they would shake their heads and reply, “Better let that be, we don’t tell tales out of school.” Others would say, “We can’t tell you anything about it. When we left we banished every memory of the old domain from our minds and have not wished to recall them.” Another would answer: “Too many large families, poor and hungry, who could do no work, or were incapable of supporting themselves, got among us and were a continual expense—a hole in the meal bag from first to last, to the association.” The incompatibility of such a system with Yankee ambition, independence, and individual enterprise ever has caused and ever will cause its failure. Should from his dinner bilk.